The GOSPEL LEARNING CENTER is an online School hosting program created for Seventh-day Adventist Church organizations and ministries. It is dedicated to present the unique message this church has to the world for this time. This program provides the software and server support to operate online / correspondence schools or training programs using the best internet technologies available. Our goal is to provide the support for your school to grow world wide for the glory of God. Full school management of student accounts, transcripts and communication. Student access is through existing church or ministry websites. Automatic scoring for online student lessons greatly increases staff productivity. Enhanced correspondence course support. Mail merge labels, student and pastor follow up letters are published to PDF for printing. Letters are automatically saved to the student accounts. Form letter structure allows customization for each student based on features tracked in the program. Seventh-day Adventist church pastors, Associate pastors and Bible workers can use the Church Follow Up Management to track student contacts assigned to them by the Bible Schools. Evangelists can associate with a church they will be holding meeting at to see the student activity in the church area. Church members may use the School Associate program to promote member schools of their choice and see the results of their work in real time. Students can take interactive courses offered by member schools. Course lessons are graded automatically; no waiting for the next Lesson. Try our Demo School showing some of the shared courses and languages available. Books may be used as textbooks or additional resources in a school or just to handle language translation and publishing of them. Any of the content placed into the GLC program may be opened for language translation done by approved volunteers or your paid staff to work on using the GLC Language Translation Entry program. Book and course authors can have a place to showcase their courses, whether beginning or advanced course structures and manage share agreements with member schools. This also includes video programs. All Services are now open for application on the Application Information page. 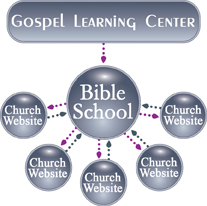 The Gospel Learning Center hosts your Bible School providing the software to create and manage your school. No software to install or programming needed. Your school is seen and accessed from your website. You can have more than one school; each with a different purpose such as a training program. You may allow other churches to have a student logon page to your school in their websites which brings more students into your school. If you have more than one website, each of them may have a school access page. If your SDA church would like to have a student logon page in your website to a participating GLC member Bible School, please apply using the Website Application form. NOTE: School set up and content creation has no support fees until students can start taking the courses. Students may be online, correspondence or both in a school. Programming is available for Windows Servers to transfer correspondence student records to the GLC program and download graduates from the GLC program for the school. For non Windows servers and software, an API interface is provided to communicate with the GLC program. More about School Management. This service provides ministries and individuals a way in which courses and resources which may be shared with operating schools can be created and managed. This also allows the content to be opened for language translation. This program provides Resources and School Administration program access but will not have any student access. This service is free! More about a Resource Content Provider. This program contains the Library Management sections for online Books, Media content and Online Libraries. This provides resources that can be used or referenced in Courses for your school, shared with selected schools or available to all schools using this program. All Book and Media library contents support language translation using the Language Translation Entry portion of this program. Source books may be entered in any language and translated by people to any other language. You manage your content for share permissions, translation and publication. More about the Resource Libraries. School Courses – Translation of any school courses opened for translation. The Translation Entry program is open for translator applications. Translator application form is in the Translation Support page. The Gospel World is a virtual world dedicated for school use providing training and "live" classroom options. Implementation of the virtual world has started on 8/15/2013 with the server configuration and software installation. More information will be posted as this progresses! 2/8/2014 The first region in the world was created. 3/20/2014 Terrains for Administration, Welcome and the Public Islands have been created. Construction begins! June 2014 Report – Video tour of the world at this point. August 2014 Report – World map display is now working. See more in the Gospel World page. Please see the Program Structure for more information on what has been completed and what is still pending. Copyright © by Gospel Learning Center. All rights reserved.